Cream cheese is great in other recipes too but in this post, I am focusing on taste and consistency specifically for bagels. For being the most expensive, Daiya was sadly the most disappointing. Even though the consistency is fantastic, the taste is super tart/sour. Tofutti has a decent taste and a decent consistency. Follow Your Heart is probably my favorite out of all the brands. It has a good consistency and tastes great. Trader Joe’s tastes really good but the consistency is pretty watery. Trader Joe’s is the cheapest but with FYH being the second cheapest, it is definitely worth spending the tiny bit extra. 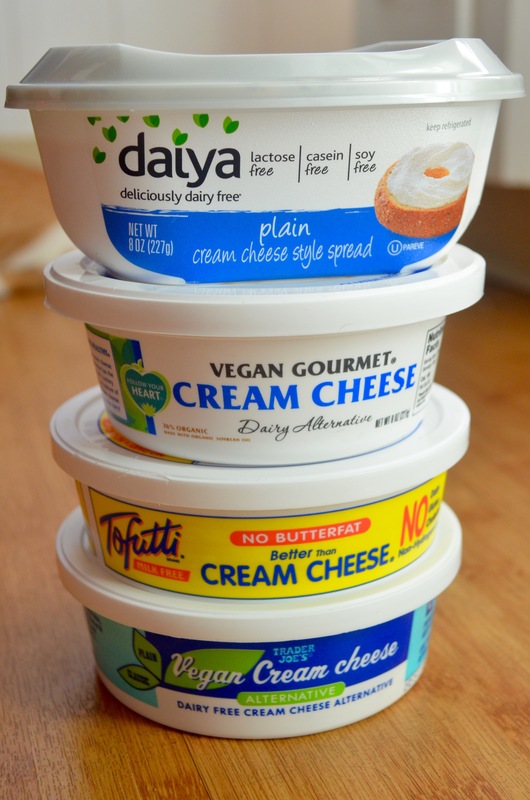 It would be great to hear what brands you guys like or dislike and if you have any other recipes for using cream cheese. Happy Halloween everyone! Great idea to compare them, love this!